Refractive clear lens extraction replaces a natural lens with an artificial one to improve vision. Complications are rare and similar to those associated with cataract surgery. Along with the cornea, the lens of the eye focuses light on the retina. If this focusing system doesn’t work well, the result can be nearsightedness (myopia) or farsightedness (hyperopia). Options for treating these types of poor eyesight include glasses, contact lenses, refractive eye surgery such as LASIK and, particularly for myopia, replacement of the lens with one selected to improve focus. Lens replacement surgery is the same as cataract surgery except the removed lens is clear, its ability to function hindered only by its poor focusing ability. By contrast, a lens affected by a cataract is cloudy. Because glasses and contact lenses can usually provide similar improvements to vision, refractive clear lens extraction is considered a form of cosmetic surgery. It usually is performed to treat people who have very severe nearsightedness. Cataract surgery is among the safest of eye surgeries with a rate of complications estimated at 2%. Patients undergoing clear lens extraction benefit from the experience ophthalmologists have gained performing this common procedure. Some ophthalmologists estimate its complication rate to be around 5%. Immediately after surgery, patients can expect to feel a little discomfort and some itchiness, both of which are normal. Other complications, such as drooping or swollen eyelids, or increased pressure in the eye, are routinely resolved with medication and/or further treatment. Swelling of the eye’s surface (corneal edema) usually gets better in a few days after the operation. Despite the low risk, it is important to be able to recognize major problems that might develop after surgery. In some cases, the layer of light-sensing cells, the retina, separates from the back surface of the eye. A detached retina causes vision to be hindered by what seems like a curtain moving across the visual field. A rare but serious condition, it requires immediate treatment. People who are very nearsighted have up to ten times the risk of retinal detachment. Another rare complication involves swelling in the central part of the retina (the macula) following cataract or lens replacement surgery. This condition, called cystoid macular edema, affects vision in the center of the visual field, the portion that detects the most detail. It usually is treated with anti-inflammatory medications. Blurred or distorted vision may be a sign that the implant has shifted away from its proper orientation in the eye. Fortunately, a dislocated intraocular lens often can be repositioned relatively easily during a second operation. The second procedure should not be delayed long because a dislocated lens can become set in place by scar tissue in a matter of months. If this happens, it becomes much more challenging to reposition it correctly. Inflammation can result if a piece of the old lens, which is broken up prior to removal, falls into the space behind the membrane that normally separates it from the lens. A doctor may treat such retained or dislocated lens material by removing the gel-like substance, the vitreous, that fills the back chamber of the eye and replacing it with a sterile saline (salt) solution. Endophthalmitis is a bacterial infection inside the eye. It occurs in only 0.033% of cases. It causes pain, light sensitivity and redness. Proper sterile techniques and use of antibiotics account for the low incidence of infection. Modern surgical procedures for removing and replacing lenses require much smaller incisions than they did in the past. This advance greatly reduces the chances of bleeding (choroidal hemorrhage). Although it isn’t possible to predict who might be affected by this unlikely complication, there seems to be a greater risk for older patients and/or people with high blood pressure or glaucoma. If the bleeding is limited, it may not significantly affect vision. If, however, it is extensive, it could result in permanent loss of vision. Multiple studies suggest that clear lens extraction to replace poorly focusing lenses produces good results in the majority of patients provided they are well evaluated before surgery. 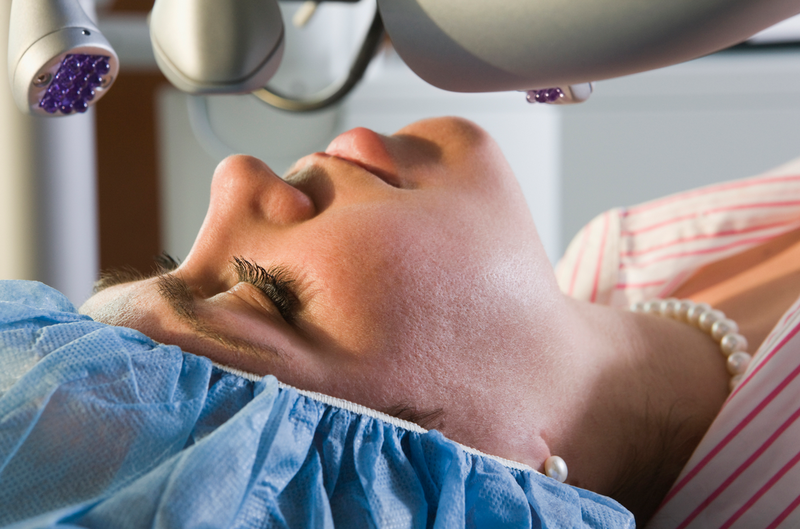 Pre-op evaluation can identify eye conditions or diseases that increase the risk of complications. Following surgery, patients should immediately contact their ophthalmologist or go to an emergency room at the first sign of any serious complication. My mother got this surgery, best decision she ever made!